Harlem Shake is located near what many call the heartbeat of Harlem which is 125th and Lenox. Underneath the direction of the dynamic duo Jelena Pasic and Dardra Coaxum, they have made serving up classic American food and supporting the neighborhood look easy. 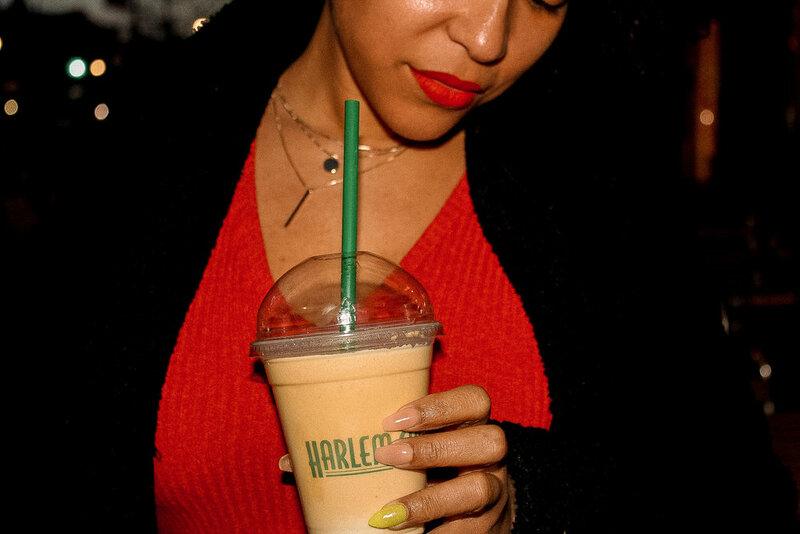 Harlem Shake is a casual eatery that has a retro diner decor and a large outdoor seating area (which makes great for people watching on Lenox - bring ya shades). 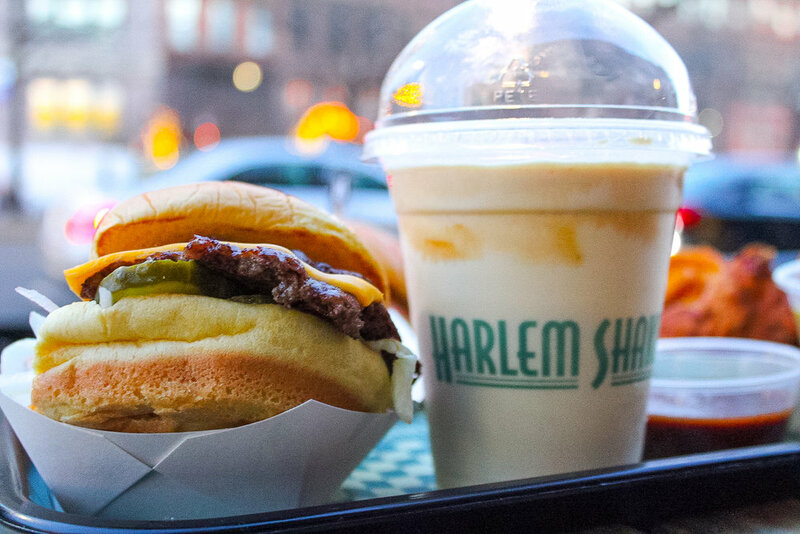 Harlem Shake's menu includes Pat La Frieda burgers, hot dogs, milkshakes, breakfast/brunch items, and more. The interior of the restaurant reflects the culture and history of Harlem with their Wall of Fame & Fro with the likes of Diddy, Questlove, and the late Maya Angelou. In the bathroom of Harlem Shake, they have vintage covers of Jet Magazines displayed on the wall showcasing some of the most influential individuals in Black culture. Having a business in Harlem that is inclusive of the people that live here in this historic neighborhood and home to the Harlem Renaissance is necessary. With the changes and growth within Harlem, some restaurants forget to incorporate the local community or highlight the history that deserves to be celebrated. Each year Harlem Shake holds a competition for Miss (or Mister) Harlem Shake and the winner gets to be the face of this Harlem staple for a year. With this fame comes a cash prize, a donation to a Harlem based non-profit of their choice, riding in their float for the Harlem's annual African American Day Parade, and burgers for a year! The requirements for this annual competition is to be a Harlem Resident and within 18 to 98 years old. If you are interested in throwing your hat in the ring, then click here. Let's get down to business and talk about what is important - food. All of the food at Harlem Shake is made fresh to order, and my grandma always says “Anything worth having is worth waiting for”. Their burgers are made from Pat LaFrieda beef which means it is top grade beef, and they use the smash griddle technique which allows for a nice crust and maximum flavor. 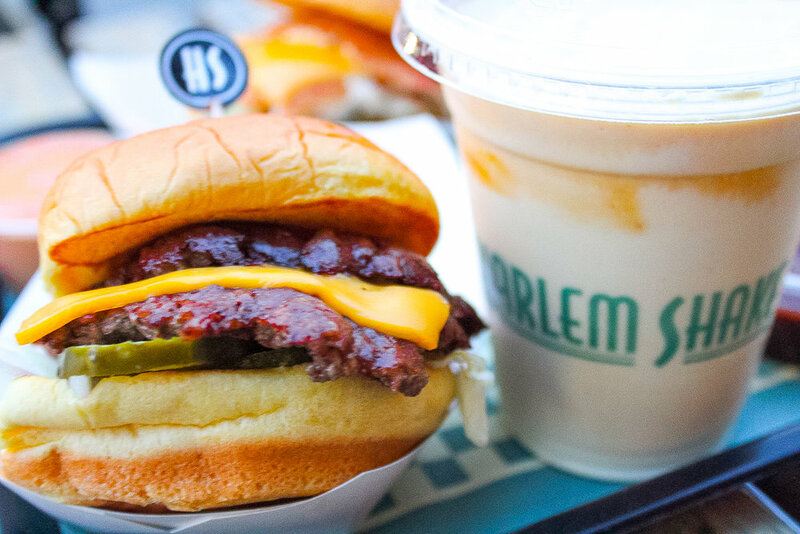 My personal two go-to items at Harlem Shake includes the Harlem Classic (beef or turkey) and the Hot Mess that has pickled cherry peppers, bacon relish, American cheese, and smokey chipotle mayo. Blue Marble ice cream is used to make their signature Red Velvet Shake. Harlem Shake has been mentioned in Zagat, Eater, New York Times, and Wall Street Journal because of the unique dining experience they provide. My meal was comped at this establishment, but this review showcases my own opinions.